1) Trimming the existing plywood planking- How close to the sheer should I trim the plywood planking? My initial thought was to leave the planking about 1/8 or 1/4 proud of the sheer (below the sheer for an upside-down boat) and cover all side plywood with mahogany veneer. Then I started looking at the drawings and remembered the notches on the outboard side of the frames. Do the notches get filled with solid wood blocking and then a covering board? If so, how is the blocking shaped or tapered when it gets back to the transom curves? 2) The plans call for thin strips of mahogany veneer planking (1 3/4 to 3"). Most builds I see have used only five or six boards on each side (5-6 in wide planks). I assume that the wider boards are a more traditional look? I also assume that some of the ~5 inch planks will have to be up to 10" inches when I spile? I've looked at builds with and without spiling and I like the spiled look better. I've read about several techniques for spiling and I am planning to buy a trim router with a guide so I can use that technique. Couple of thoughts I am covering now and I am thinking about the same issues. 1. Question 1 will probably leave a small amount proud, having seen a barrel back here in town he will be tapering the top rail anyway so it looks as if it will cut into the finished sides anyway even if left flush. So a 1/4 or so will not do any harm. Hope to find out in about 3 - 4 months. 2. For the second I went with 6 planks due to the width of the veneer I purchased, between 5 and 5 5/8 when straight edged. I purchased from https://www.certainlywood.com they had great service. I tried making myself but kept ripping out below a 1/4 so the work and wastage would of added up quick. I read a lot of the posts and went down the boat with a set of dividers to keep me parallel along the hull at 6 inch intervals, dividing for 6 planks. so I did not end up with a banana shape at bow and stern. That size plank works well but you get a lot shorter as you get towards the front but the stagger doesn't look bad. I am posting more pictures as I go I am 1/2 way through the planking now. Thanks Bryan! I looked at certainlywood online. Seems like a great option. I assume that you had to special order 1/6 thickness as I don't see that option on the web site? Is there a reason why you went with 1/6 over 1/8th? I assume you applied the 1/6 and did not plane it down to 1/8? I'm asking because I have had a devil of a time getting the plywood to take the bends at the bow and the stern extremes. I was thinking that 1/8 might be more flexible and easier to apply? I really like the look of your boat with 6 strakes...and think I will opt for same. Looks like your veneers were as wide as about 10"? 1/8" is generally 3MM. 3/16" or 1/6" is probably 4mm. Depending on the size of the hull and the shape, the original mahogany runabouts had 5 to 7 strakes, they were typically cut from 1/2" thick by 12" wide stock. The planks were spiled to the required shape to sort of look "straight" when viewed from the side (not upswept at the bow or stern). When laid flat the planks were usually long sweeping curves of varying width. Basically, you divide the distance from bottom edge of the chine to the top edge of the sheer at each frame into equal parts (5 parts for 5 strakes, 6 parts for 6 strakes, etc.). Mark these on the edge of the frames and connect these forward to aft and you have your plank joint lines. You can make your spiling battens from 1/4" by 2" or 3" wide stock, laid in place of the plank you want to make. If the spiling batten needs more curvature to stay between the lines you can cut it and lap a short piece at the joint to keep the batten's required shape. Mark the frame lines onto the spiling batten making sure you keep the same angle of the frame line as it crosses the batten. Then use a compass to mark a radius from the point where the upper and lower plank edges cross at each frame line. Mark the batten with a convenient radius so that it crosses the frame line on the batten. Mark the batten at each frame line with the compass radius you had set (they will vary at each frame line and distance to upper and lower plank edges), you will use these again. When you have marked up the spiling batten, lay it on the plank stock and transfer the frame lines to the plank stock, understanding the frame lines are probably not square to the edge of the stock. Next use each radius you marked on the batten to mark the upper and lower plank edges. Do this by placing the compass where the radius mark crossed the frame line on the batten and scribe that radius onto the plank stock, make sure it crosses the frame line on the plank stock. When the plank stock is completely marked, remove the spiling batten and then use a long square batten to connect the points where the radius marks cross the frame lines. Mark the edges of the plank along the batten and your spiled plank is ready for cutting out. Chances are pretty good this same plank shape is good for the opposite side of the hull too. On the Key Largo the strakes will have lots of curvature at the bow and stern, lots of variation in the width near the stern. This is a wordy description for a relatively simple process but if you check on Bill Checkerberry's (billyc) Belle Isle project and Bob Perkins' Biscayne you'll probably get a better idea than I can describe here. Have fun and post pictures! They are 1/6" Sapele, they had an end batch and I had them cut into a mix of 8ft, 7ft, 6ft and 5ft lengths (158 sqft). This got me standard shipping anything over 8ft was freight. The widest veneer they had was no more than 5 3/4 wide, with most 5 1/2 to 5 1/8. When I lay the pattern on the veneer I angle to get the maximum length depending on the curve at that point, really only an issue at the bow. They were a bit rough, although they are kiln dried I have no humidity here which seemed to make them a bit rougher with grain lines and a little brittle, I let them sit a month before using them. To save that precious fraction of an inch I put the transom on as is and had a tough time laying them flat and a lot of sanding to get passed the grain/sap lines to a smooth surface. 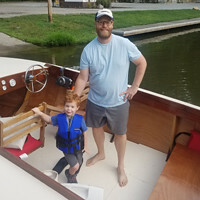 I used fast epoxy on the transom, which I will not do again using the slow lets every thing soak in longer and I am a lot happier with the sides. For the hull I ran them through my drum sander first, this took out the roughness one pass on back and couple on front. They are now down to 1/8" and are a lot more flexible, I would not put through a planer. I also let the epoxy soak in a bit before applying, they go on easier than the ply, I am not using staples, I am using screws. So at the back I have been using cargo straps and wedges to curve round the transom and I have a lot of weight and clamps holding them on the sides, looks a bit like I am holding a wall up with all the props against the hull. I will add some pics to the gallery shortly. As they setup I use acetone to remove any excess Epoxy as I go. I would suggest going with 1/8" planking. I laid out my planking scheme as can be seen in the pictures below. After marking the division points on the side of the boat, I used screen molding in order to get a nice smooth curve by temporarily stapling it in place. I got the manufactured molding, not the pine ones. If you enlarge the picture you can see my division points along the side of the boat a foot apart. The blue lines are where each plank would end. I have six planks on each side of the boat. The mahogany planking on my transom is 4 layers thick resulting in a 1/2" cap. At 1 foot intervals, I divided the height into 6 parts, and then connected the dots with the molding, and then drew the line. The result where the planks will go. Peter, I went to the billyc Belle Isle site...very helpful. Jim...I saw your direct message, but the site would not let me reply as I have not been a member long enough. I have actually been on the site for over a year, but my account stopped working under mickffly and I restarted under mickfly). Bryan, certainlywood.com said they could not give me sapele or mahogany thicker than 1/16. I responded that I had a picture from a fellow boat builder (you) showing 1/6 sapele. We'll see. I may give a nod to my local lumber yard. They've offered a very reasonable shop fee for resaw. Also, I ran across some pictures (probably the Belle Isle build) that showed the recently righted boat with the planking (and fiberglass) nearly flush with the sheer. Thanks for being a few weeks ahead of me! Oh...and you and I must share the same taste in tools...probably not the same models, but I have the same color chop saw, compressor, extension reel and even the same style floor pads in my shop! Thanks, as always to the members of this site for giving me the confidence to do something that's just a little beyond my talent level! First picture...The transom of the boat will have the boat name in a stylized version of my father's handwriting (and the name is a tribute to him). The transom pic below has a sample of Dad's handwriting...an address label from a package he sent to a dear friend of ours...sealed into the "time capsule." I added some other names before covering it all up...last night. The second pic...I put gel magic on the edge seams of the first few pieces of side planking...when they dried a few of them were out of register. I had to use a sharp utility knife to separate and repaired the gaps before second layer. I stopped edge gluing after that and just applied a generous amount of gel magic to each seam before applying second layer. The third pic...no excuses...but I worried all along that I was using too many plastic staples. Then I saw Jim's picture of his well fastened bottom planking. Now I think I may have used too few! Just looked on site they are not showing 1/6th anymore, sorry must of taken the last of it :} . They do say they stock some of the different sizes intermittently. Love the time capsule, we included one as well with build details and a laminated picture of the family standing by the project. I am using the plastic staples as well which work great, a lot easier than removing them if I had used regular staples. Know that saved many weeks of extra work, with help of a friend got all layers on all sides in about 7 weeks. I am not using them on the exterior planking as they are a bit thick and on some tests could split the veneer. Need some advice from the forum. I just got my sapele...in 6", 7.5" and 9" widths. The lumber yard (Berlin-Myers, Summerville, SC) did a great job selecting color and grain (quartersawn stock). However, most of the boards have a smooth (planed) side and a rough (band sawn) side (see below). I am trying to decide whether to glue the rough side and put the smooth side out or vice versa? Just a few seconds with a random-orbit sander (80 grit) knocks down the high spots on the rough side and I think it will adhere well if I use a generous layer of gel magic. I tried sanding the rough side smooth and figure that it will be a nightmare to do that on the entire boat. -or...use my three-blade dewalt planer to take a pass on the rough side (I recall someone saying spray with water to prevent tearout). The veneer is already at 1/8 or a tiny bit thicker...so I don't have much planing room. As always, the advice of those in the forum is appreciated. I couldn't do this without you. I was going to say plane it until I saw you said it was only 1/8" thick. Thickened epoxy would work really well on that roughness. Gel magic is pretty expensive though. Have you tried thickening regular epoxy? Your boat looks great so far by the way. I had similar on my veneer kept the smoothest side on the out side and the slightly rougher on the inside to the plywood. On the first batch I left both sides rough on the transom and it was a lot of work block sanding the ruts out once applied. For the sides I used a drum sander to get a good side and the other a scuff to take a portion of the roughness out, I had a tiny bit more leeway on thickness. Using thickened epoxy on the glue-up. You indicated that the planks are slightly over 1/8", so with that in mind I would try to take them down with the planer on the finishing speed. Sounds like you have the same dewalt planer that I have. Make sure you have sharp blades. You might even consider rotating them so you have a fresh blade edge. You have a higher risk of tearout the thinner you go. Look at the edge of the board to determine which end to feed into the planer. You want the grain to point downward as it feeds into the planer to avoid tear out. Set you planer so that you go no thinner than 1/8". Slowly bring down to the 1/8" thickness with numerous feeds. Spray the board with water especially if there are parts where the grain is not straight. If it doesn't work with the planer, I would use a drum sander. You won't have to worry about tearout, but it is a slower process. I have a drum sander, but my first choice would be the planer, if it works. What you are looking for is a consistent thickness. You might end up with some boards smoother than others depending on your starting thickness. I always attach with the better side out. I have used planks that have tearout on one side. That is the side that I epoxyied against the plywood. I like to use glen-l's poxy grip because it is nice and thick. I would use a drum sander as first choice, as you can leave a scratch pattern for greater adhesion. The planer would work fine also and you already have one. In either case I would remove only a small amount of the bandsawed surface rather than going to smooth. Thanks all. I don't have a drum sander and a quick look around the web did not turn one up that is reasonably priced...especially for the limited use it would get in my shop after the build (I was hoping Harbor Freight!). So, I'm left with trying the planer, which is appealing since the boards seem to be slightly different thicknesses, which will cause headaches if applied as is. A few of the boards are slightly curled...and I worry that they will snipe or bind. I am thinking about a jig that provides the height I will need to plane thin strips...but also have a cleat with a spacer that provides only about 3/16 clearance. Each board will have to pass under that cleat that each board so the curl will come out right before the stock goes into the blade. I have been using the planer for four or five years and never flipped the blades...so I can do that and get a nice, sharp cutter. If I get tear out, I will have to defer to a quick hand sand and application. Gel magic is expensive, but works out to about $30 per gallon more than Poxy Grip...with some tangible benefits. I have not "lost" a single batch due to pot life...it cures in the colder night temps in the garage, and is easy to work with. To be fair, I started with Poxy Grip which worked fine but I struggled with accurate measurement...and coincidentally figured out some better measurement techniques when I ordered the first tub of gel magic. Thickened epoxy would probably be even cheaper, but I might be a gel magic devotee. For the entire project it will cost a few hundred more...and hopefully, less angst! On the positive side, I took advantage of the "LOVEU" valentines sale at GLen-L...and ordered most of my hull and shaft parts! Saved about $200. The rudder arrived yesterday and a more beautiful hunk of bronze I have never seen. I could not resist running down and holding it in place, even though I have not drilled the hole! I am very excited to be progressing toward the flip.